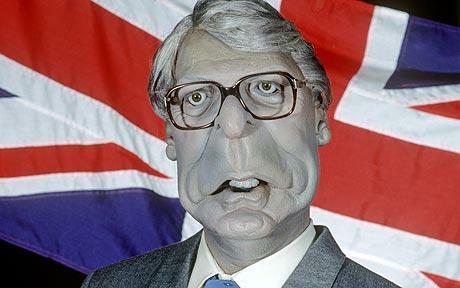 John Major was entirely painted in grey. Home Secretary Kenneth Baker was a slug. Future Prime Minister Tony Blair was portrayed as a wayward child while Edwina Currie was a malevolent Cruella Deville figure. 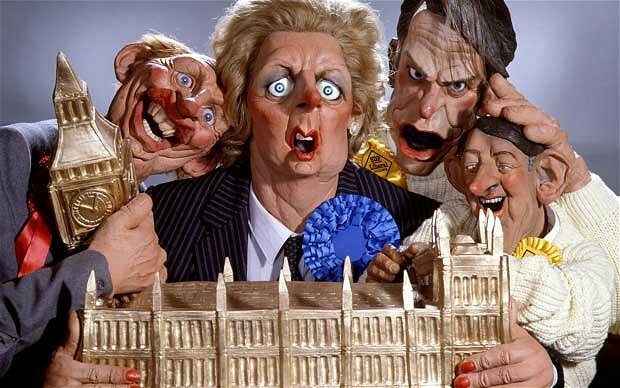 The puppet-based comedy Spitting Image first appeared on our screens thirty years ago in 1984 and ran until 1996. There had never been anything like it before and has been nothing like it on British TV since. It made its mark on the times in a way that no other comedian, TV show or satirical cartoon of the time could ever have managed. Perhaps it could only have started in 1984, a time when the forces of conservatism seemed perilously close to absolute victory. Margaret Thatcher, simultaneously the most loved and loathed Prime Minister of all time, had won a second landslide election victory the year before and was now taking on the miners, a battle she would ultimately win. The unions were in revolt, unemployment was sky high. People were angry and yet the Opposition which was split between Neil Kinnock’s Labour and the Liberal-SDP Alliance had never looked weaker. There was something of a political comedy void too. Mike Yarwood, a huge star in the Seventies, was far too gentle (and troubled) an impressionist to continue through the Eighties. By 1984, his career was in freefall, perhaps partially because he was unable to convincingly “do” Margaret Thatcher. Yes Minister, meanwhile, was a brilliant political comedy, but it was set in a fictional and non-partisan political landscape (Jim Hacker was never identified as belonging to any existing party). Meanwhile, Not The Nine O Clock News which had lampooned many public figures during the early Eighties (while rarely actually impersonating them) had ended in 1982. Smith and Jones had begun their own largely non-political sketch show while Rowan Atkinson was now in Blackadder. 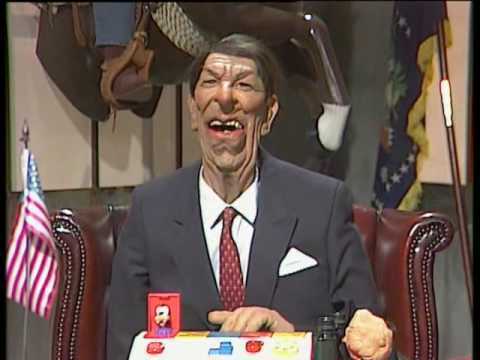 NTNOCN producer John Lloyd would be instrumental in launching Spitting Image for the ITV franchise Central in 1984. The project was hugely ambitious: it was the most expensive light entertainment show of the time. 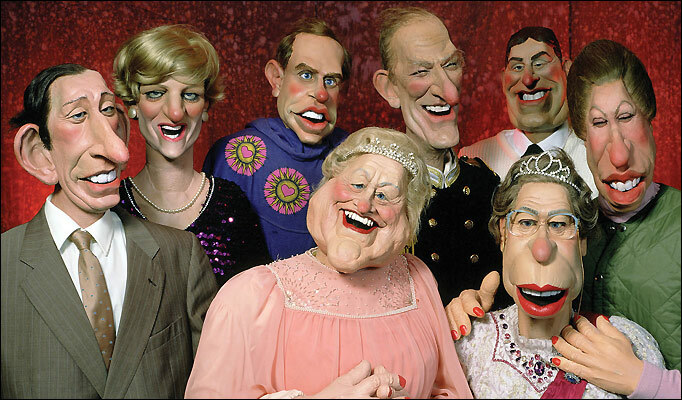 In retrospect, we should be less surprised that the results were patchy (and they were) than by the fact that Peter Fluck and Roger Law’s puppets were nearly always easily recognisable and that Spitting Image not only managed to be produced so close to transmission time (some scenes were even broadcast live) but that the show was so often on the mark, highly topical and frequently very funny. Some public figures will be forever linked with their puppet counterparts. To some, Norman Tebbit will always be a leather jacketed yob, Michael Heseltine a swivel-eyed loon vocally denying any intention of standing against Thatcher for the Tory leadership while simultaneously wearing a sign saying “Vote for Heseltine” on his back while, for many, Kenneth Baker, as mentioned, will always be a slug on a leaf. Gorbachev: Ron, do you know what I see when I see when I look into those flames? I see our two nations living in peace and harmony… what do you see? Reagan: I see a little doggy, a bunny wunny and a big hippo on a broomstick. Hell, this is fun! Margaret Thatcher herself, meanwhile, was usually portrayed (rather sexistly) in a man’s suit (something which may actually have helped her image). John Major, her successor, initially appeared as a robot being secretly controlled by Thatcher before becoming the totally grey figure he is now remembered as, complementing wife Norma on her peas (“Very tasty”) while secretly nursing a childish crush on colleague Virginia Bottomley (prompting Major’s cabinet colleagues to taunt him by chanting “John loves Ginny!”). Major’s earlier affair with Edwina Currie was, of course, at this stage not known to the general public or to Spitting Image’s writers. Currie, in fact, undeniably benefited from the publicity her puppet generated. She was, after all, a junior minister and never in the cabinet. How many junior ministers can you name today? This was not solely Spitting Image’s doing, but it surely helped. The same is true with Labour frontbencher Gerald Kaufman. He was never exactly a household name but got attention simply because Spitting Image claimed he went around saying creepy things such as (inexplicably) “sweaty palms”. Others liked the attention less, though many like to pretend otherwise. Liberal leader David Steel openly claimed that his image was harmed by the impression he was in SDP leader David Owen’s pocket. It is doubtful Roy Hattersley (who has a genuine speech impediment) enjoyed his depiction spluttering spit everywhere (notably spitting out the words “Spitting Image” during the title sequence) either. It wasn’t just the politicians, of course. The portrayal of the royals was always controversial. An early episode saw the Queen “christening” Prince Harry (who had an unflattering puppet from birth) by smashing a bottle against the side of his pram. Elsewhere, Jeremy Paxman (one of the few figures still in the public eye both now and then) memorably began every broadcast with a sneering “yeeeeeeeeeeeeesss” while the late newsreader Alistair Burnett was seen as being in love with the Queen Mother. Rupert Murdoch, meanwhile, was seen as a crude figure constantly breaking wind while all journalists were routinely portrayed as pigs. It had to end one day, of course, and in 1996, it did. Tony Blair was initially portrayed as a schoolboy because of his relative youth. He soon became a super hyperactive figure on becoming Labour leader in 1994. But while both he and successor Gordon Brown had puppets, the show didn’t get to see New Labour in power. The programme never received much critical acclaim but effectively launched a thousand careers with Ian Hislop, Clive Anderson, John O’Farrell, Ben Elton and Red Dwarf’s Rob Grant and Doug Naylor (authors of The Chicken Song) amongst the numerous writers and Chris Barrie, Steve Coogan, Harry Enfield, John Sessions, Rory Bremner, John Culshaw, Alistair MacGowan, Steve Nallon and Hugh Dennis all amongst the vocal talent. Could it happen today? Animated copycats like 2DTV and Headcases both proved failures although Round The Bend, almost a kids’ version of the show with puppets by Fluck and Law enjoyed some success in the Nineties. But in the age of Boris Johnson and Nigel Forage perhaps we need a Spitting Image now more than ever?